The building of the Urbana church began in 1853 with the laying of the first cornerstone. Built just before the Civil War, the original frame church featured a gallery, most likely for the blacks. The church forbade membership to anyone who held slaves. By 1866 the church had fallen on hard times, coming very close to a sheriff’s sale. After an audit and fundraising effort, the outstanding debts were paid and the church continued. 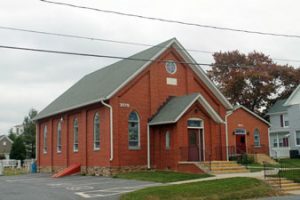 With the financial crisis averted, the leaders of the church incorporated, giving it the name Wesley Chapel Methodist Episcopal Church. The present brick sanctuary was completed in 1895 with Mary Rosailia Kidd and Charles Dudderar being the first couple to be married here in 1899. In 1900, the Quarterly Conference voted to build a parsonage on the lot adjacent to the church. Wesley Chapel has seen change and sometimes welcomed it. The task of the leadership today is to help the people embrace change, each other, and the new community for prosperity and vital ministry.